On September 19, a celebration ceremony was held for gold medalist Shohei Ono and bronze medalist Kento Masaki in Dining Hall No. 2. About 900 people were in attendance. 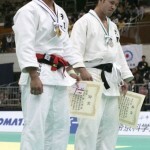 The Shinbashira gave his congratulations to both athletes. Both Ono and Masaki received awards from Tenri City and offered words of appreciation.